Posted in eBrary, Shibboleth on September 2 2014 by Resource Discovery and Innovation Team Manager. The eBrary Patron Driven Acquisition period (which began in June 2012) has now concluded. The metadata records of all titles which were purchased during the PDA period have been updated in Library OneSearch (and in the Aleph client) with the indicator: “This eBook has been purchased from the eBrary PDA collection”. All non-purchased eBrary PDA titles have been removed from Library OneSearch and marked as ‘suppressed’ in Aleph. These non-acquired titles will be removed from Aleph completely, once this list has been cross-checked against current Resource Lists (and any eBrary PDA titles added to resource lists which did not reach the trigger threshold for acquisition during the PDA period have been reviewed). Posted in eBrary, PDA on November 25 2013 by Resource Discovery and Innovation Team Manager. The issue preventing the purchase of eBrary PDA titles, reported on 12 December 2012, has now been resolved. Purchase requests for PDA titles on the eBrary platform are now being accepted normally in line with the configuration of the PDA plan and profile. Posted in eBrary, PDA on January 18 2013 by Resource Discovery and Innovation Team Manager. LLR is working with eBrary to reinstate full-text access to not-yet-purchased titles in the current eBrary PDA (Patron Driven Acquisition) collection in Library OneSearch. A further update will follow once PDA activation on the eBrary platform has been reactivated. Posted in eBrary, PDA on December 11 2012 by Resource Discovery and Innovation Team Manager. A total of 3855 eBrary PDA (Patron Driven Acquisition) eBook titles are now active and available in Library OneSearch. The titles are identifiable by the ‘Electronic local note’ indicator text: “This eBook is part of the eBrary PDA collection – but not yet purchased” (the thumbnail below is a link to a full size illustration). 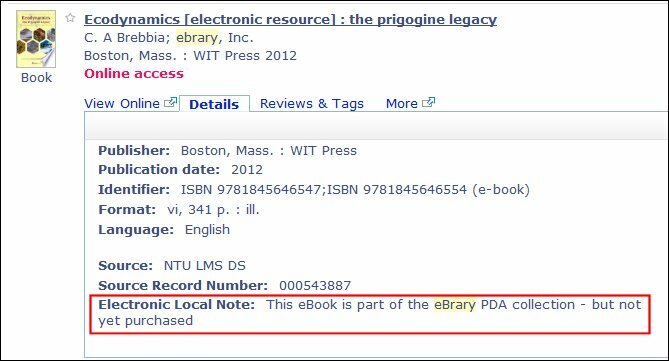 As eBrary informs LLR of purchases made through PDA, this text will be updated at the individual title level to indicate that this eBook has been purchased outright. Posted in eBrary, PDA on June 6 2012 by Resource Discovery and Innovation Team Manager. While we have yet to receive final confirmation from eBrary’s technical team that the service issue has been completely resolved, access to eBrary eBook titles through both eSearch and the Library Catalogue is currently available once again. Posted in eBrary, Shibboleth on June 21 2010 by Resource Discovery and Innovation Team Manager.